The time tracking feature in InLoox PM 7 enables you to create time tracking entries without opening a project and provides you with the overview of the time tracking entries from all current projects. Click the InLoox PM tab on the Outlook Ribbon and then Time Tracking. 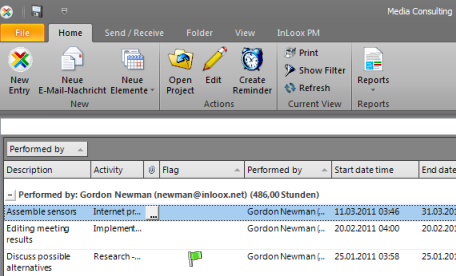 In Outlook 2003/2007, click InLoox Folder in the InLoox PM Toolbar and then Timeline in the InLoox PM project list. Create a new entry In the New group, click New Entry. 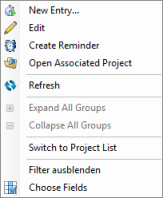 In the Add to Project dialog box, choose a project from the list and click OK. In the New Entry dialog box, fill out the fields. Open a project Choose an entry from the time tracking list and click Open Project in the Actions group. Edit an entry Choose an entry from the time tracking list and click Edit in the Actions group. In the Edit Item dialog box make the changes you want. Create Reminder Choose an entry from the time tracking list and click Create Reminder in the Actions group. For more information, see Create a reminder. Print the time tracking view Click Print to start the quick print feature of the time tracking view. For more information about printing, see General features and printing of the project list, in the Print in the project list. Search for the entries by using a filter In the Current View group, click Show Filter. In the Edit Filter dialog box, choose between All actions and Entries matching. By clicking Entries matching, define the filter criterion and activate the corresponding check box. The available criteria are Date between, Performed by, Group. In the Time tracking list, those entries are displayed, which correspond with the defined criteria. Refresh All changes will be updated and the view reloaded via the Refresh button in the Current View group. Issue a report Optionally, you can also issue a report on this view by clicking Reports in the Reports group. For more information about reports, see the category Reports. Group the time tracking list Draw the column name into the area above the list. The context menu provides you with almost all basic features that can also be found on the InLoox PM Ribbon, such as New Entry.., Edit, Create Reminder, Open Associated Project, Refresh , Show Filter. It has also provides the features Expand and Collapse All Groups and Switch to Project list. Right-click in the time tracking list to open the context menu. Choose Fields This feature sorts and organizes the entries by selected data. How to edit the time tracking view | InLoox PM 7 • Copyright 1999-2019 © InLoox, Inc. All rights reserved.